Not only does this delectable liquid stimulate your taste buds and whet your appetite, its unique taste and aroma has also sprung off many time honor cooking ideas and recipes such as the cannot-be-missed honey baked ham and honey dips. But is honey really good for you? This caramel-like liquid seems to be full of calories. ...sure it tastes good and has a pleasant texture that coats the irritated throat, but is it no more than just a tasty placebo? Here are the first 5 benefits of honey you must know! 1. 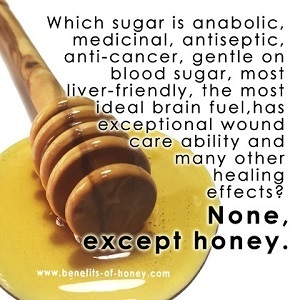 Honey isn't Just Sugar! Though highly regarded in ancient civilizations, honey is not appreciated enough in today's modern societies. Critics quiz, "How can anything that tastes so good be of any good? Isn't honey just fancy sugar?" The liquid is so sweet and comforting that many people do not give its healing abilities a second thought. Conventional nutritional authorities claim that sugar is sugar, regardless of its source or state. They however, do not realise that the bee has added an extra goodness of their own. Honey possesses unique life-supporting qualities not found in other sugars and delivers much more than what many medical doctors could comprehend. Know that not all sugars are made equal and don't be too quick to dismiss honey as just another sugar. Honey isn't just sugar. It is more than just the sum of its sugars. There is more than meets the eye! It's baffling how some people would go about demanding for proofs that honey is good for us and yet not question a word about the processed sugars and even artificial sugars that they willingly eat. Nevertheless, today researchers are turning up more and more new evidence of honey's medical benefits in all directions. The benefits of honey don't just stop at satisfying the palate; honey also offers incredible antiseptic, antioxidant and cleansing properties for our body and health, valuable beauty and skin care tips for ladies, and amazing healing properties as a head-to-toe remedy, from eye infection to athlete foot (Refer to Health and Nutrition Resources Index Page). Its powerful healing attributes have long been used thousands of years ago and known to promote healing for cuts, cure ailments and diseases, and correct health disorders for generations after generations. Want to receive our monthly BuzZStop snippets? Sign-up below. Subscription is FREE! Read Accolades to Benefits of Honey. The renowned UMF Manuka honey, perhaps the tastiest natural medicine, is commonly cited in many discussions on health benefits of honey. This honey not only fights infection and aids tissue healing but also helps reduce inflammation and scarring. In addition, it is often used for treating digestive problems such as diarrhea, indigestion, stomach ulcers and gastroenteritis. The page, titled "In What Ways have You Experienced the Benefits of Honey?" is filled with eye-popping testimonies about the healing power of honey. I've lost count of the number of times I have accessed that page, but the stories posted there never cease to move and amaze me over and over again. With more and more health experts and theories, such as the Hibernation Diet, supporting its benefits, this oldest natural sweetener just keeps getting better. Besides its profound medicinal applications, honey also brings great synergistic health benefits when combined with other foods such as bee pollen, cinnamon, ginger and cider vinegar. Discover them, one by one at Honey Cure and Tonic Concoctions and learn what people who have tried them have to say. And with the ever-growing body of research and evidence of the immense healing abilities of other wondrous bee products such as royal jelly, bee pollen and propolis, we are so overwhelmingly grateful for what the precious bees have presented to us humans. One of the greatest pleasure and fascination in using honey is understanding the different floral varieties of honey, their appearance and quality, and experimenting with each of their unique taste and distinct flavor, and being able to know which floral variety of honey is most perfect for which kind of foods. The uses and benefits of honey in foods are as diverse as its floral varieties and places of origin. It is almost like acquiring wine knowledge through wine-tasting and getting information on the origin, quality and worth of the different wines. Very intriguing, satisfying, and even infectious! You will realize with its bewildering number of varieties, this natural sweetener is comparable to tea, coffee, wine in its complexity, and agree that it surely doesn't deserve to be labelled as a mundane or humdrum commodity which has a homogeneous taste and flavour, like water, salt, and sugar. Besides all the pages on benefits of honey, perhaps one of the most well-received topics in this web resource is related to those exotic, tantalizing recipes which I have specially created and developed using honey. I think this is what makes the honey recipes here different from the massive number of honey recipes available out there.....exotic! Continue Prologue in Honey Health Benefits. Ruth is the person behind the buzz at Benefits of Honey, an immensely rich, quality resource on honey and its benefits, and a plethora of health-related issues. To discover how incredibly intelligent natural honey is, and why this super-food must be differentiated from other highly processed and refined sugars and artificial sweeteners, join her in this website or catch her on Facebook, Pinterest, Twitter @honey_benefits and Instagram. More on the beginnings of this web resource in: About the Author. Chinese version of www.benefits-of-honey.com - Know all the benefits of honey. Its medicinal effects and health benefits. A unique energy booster and beauty ingredient. Learn great honey recipes like honey dips and honey baked hams.